The general valence shell electronic configuration of lanthanides is 4f1−146s2. Atomic and ionic radii of lanthanides decrease with an increase in atomic number. 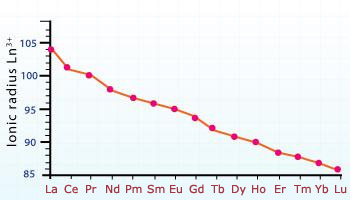 This gradual decrease is known as lanthanides contraction. Because of the lanthanides contraction, the radii of the elements of the 3rd transition series are very similar to those of the corresponding elements of the 2nd  transition series elements. Lanthanides exhibit the oxidation state of +3. Some of them also exhibit the oxidation state of +2 and +4. It is observed that in lanthanide series, there is a progressive decrease in the atomic and  ionic radii with increasing atomic number . This regular decrease with increase in atomic number is called lanthanide contraction. This is due to the weak shielding of f orbitals. These f orbitals are unable to counter balance the effect of increasing nuclear charge because of which the size keeps on decreasing with increase in atomic umber. As we move along the period from left to right in lanthanide series, the atomic number increases i.e. number of protons keeps on increasing.For every proton added in the nucleus the extra electron goes to the same 4f orbital. The 4f orbital shows poor shielding effect because of which there is a gradual increase in the effective nuclear charge experienced by the outer electrons. Thus, the attraction of the nucleus for the electrons in the outermost shell increases in atomic number. Separation of Lanthanides: Without lanthanide contraction all the lanthanides would have same size because of which if would have been very difficult to separate them but due to lanthanide contraction their properties slightly vary. The variation in the properties is utilized for separating them. 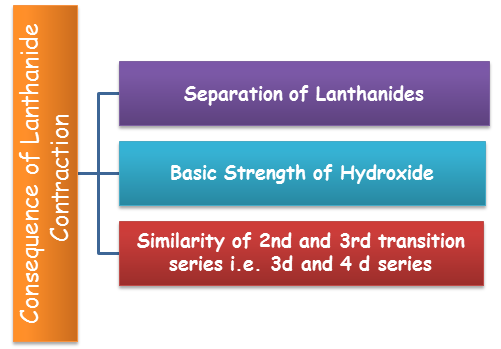 Basic Strength of Hydroxide: Because of the lanthanide contraction, size of M3+ ions decreases and there is increase in covalent character in M–OH and hence basic character decreases. Similarity of 2nd and 3rd transition series i.e. 3d and 4 d series: The atomic sizes of second row transition elements and third row transition elements are almost similar. This is also an effect of lanthanide contraction. As we move down the from form 4d to 5d series, the size must increase but it remains almost same due to the fact that the 4f electrons present in the 5d elements show poor shielding effect. Why Sm2+, Eu2+ and Yb2+ ions in solutions are good reducing agents but an aqueous solution of Ce4+ is a good oxidizing agent? +3 state is the most stable oxidation state of lanthanides. Thus the  ions in +2 oxidation state tend to change to +3 oxidation state by loss of electron and those ions which are  in +4 oxidation state tend to change to +3 oxidation state by gain of electron. The lanthanides do not show much tendency to form complexes due to low charge density because of their size. However, the tendency to form complex and their stability increases with increasing atomic number. The first few members of the series are quite reactive like calcium. However with increasing atomic number, their behaviour becomes similar to that of aluminum. Lanthanides combine with hydrogen on gentle heating. When they are heated with carbon result in formation of  carbides. On burning in the presence of halogens, lanthanides form halides. Lanthanides react with dilute acids to liberate hydrogen gas. Lanthanides form oxides and hydroxides of the type N2O3 and M(OH)3 which are basic alkaline earth metal oxides and hydroxides. Lanthanide are used in  the production of alloy steels for plates and pipes. Mixed oxides of lanthanides are used as catalysts in petroleum cracking industries. Actinides consist of elements that follow actinium and involve the filling of 5f subshell . The dominant oxidation state of these elements is +3 (similar to lanthanides). Besides +3 state, they also exhibit +4 oxidation state. Some actinides show still higher oxidation states. The maximum oxidation state first increases upto the middle of the series and then decreases i.e. it increases from +4 for Th to +5, +6 and +7 for Pa, V and Np but decreases in the succeeding elements. They have high melting and boiling points like lanthanides but don’t show any regular trend with increasing atomic number. 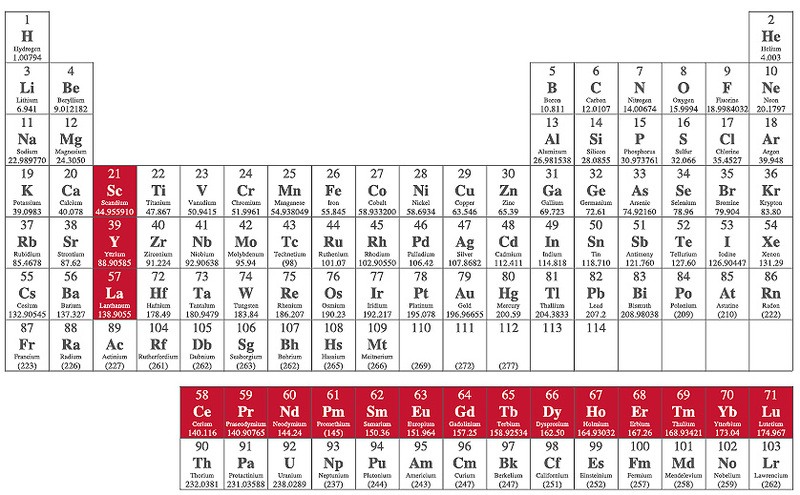 All actinides except thorium and amercium have high density. The actinides have lower ionization enthalpies as comapre to lanthanides because 5f is more effectively shielded from nuclear charge than 4f. All actinides are paramagnetic in nature. The paramagnetic nature which depends on the presence of unpaired electrons. All the actinides are radioactive in nature. Radioactivity increases with increase in atomic number. The ability of actinides to exist in different oxidation states has made their chemistry more complex. Moreover, most of these elements are radioactive and the study of their chemistry in the laboratory is difficult. They react with boiling water to give a mixture of oxide and hydride. The combine with most of the non – metals at moderate temperature. All these metals are attacked by HCl but the effect of HNO3 is very small due to the formation of a protective oxide layer on their surface.